Construction waste is often assumed to be the result of the building contractor’s inefficiencies, but much of the waste that is produced is actually as a result of the design? With more than 80 million tonnes of waste estimated to have been produced by the construction industry, good design of the building, the individual components within it, and the packaging these components arrive in, is essential to achieving a circular economy with zero waste. Make the best use of the existing resources on the site. For example if there are existing buildings on the site, can these be refurbished, or elements of the structures reused? Can certain elements be salvaged such as the bricks, or at the very least recycled into aggregate for use on the site? Can the excavated material be reused elsewhere on the site, such as in landscaping? For packaging, could we design for reuse and return, rather than disposal? Prefabrication is a great way to reduce construction waste on site. A steel frame is a good example of this, but this could also be looked at for concrete and timber structures? All highly serviced areas should be targeted (such as WCs, kitchens, etc. ), along with façade systems. Make the most efficient use of resources. For example designing door and window openings to tie in with the façade dimensions (e.g. 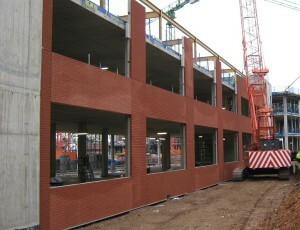 brickwork) so minimal cutting is required. This can also mean designing for optimum service life. Design the building so that it can be built as efficiently as possible. For example think about the formwork required for in-situ concrete structures (typically 20% of construction site waste is timber, much of which comes from formwork). Post tensioned concrete structures with flat slabs reduce formwork waste, and aid services installation, but you could also look at permanent formwork, or Cross Laminated Timber (CLT) floor slabs. This is to ensure whole life waste is reduced. For example relocatable partitions should be used where there is a probability that spaces will be reconfigured. Designing for deconstruction also allows for the materials to be easily reused at the end of the buildings life. For example laying bricks in lime mortar means they could be dismantled and cleaned more easily. Late changes in design may require rework of already constructed areas, and reduce the scope for off-site construction. Get the design finalised early, preferably in BIM so as clashes can be detected before they become a problem. Thinking ahead will ensure a lean, less wasteful construction process, with minimal environmental impact. A great start in moving towards circular buildings of the future.